Seven exercises to get rid of Insomnia, Lung issues, back pain, and Headaches. You've probably heard it time and time again. But Yoga really is an amazing way to stay fit, clear your mind, and improve your health. Whether it's back pain and Insomnia, Headaches or lung problems. There's a good chance that Yoga will help you get rid of it once and for all. So, without further ado. Here's a short workout that can not only be your cure for sleepless and painful nights. But first, don't forget to subscribe to our blog so that you'll always be the first to see our new article. Lie on your back with your arms resting at your sides. Take a deep breath in and lift your legs so that your hips form a 90-degree angle. From this position keep lifting your legs until your feet touch the floor above your head. Don't forget to support your hips while you're lifting your body. So, that you don't hurt your lower back. Lift your thighs and tailbone and create space between your chin and chest. your mind before heading to bed. However, if you're having a bout of diarrhea or on your period or have any sort of neck injury. It's better to exclude this pose from your training session. Start by lying on your back with your knees bent and your feet flat on the floor. Try to keep your heels as close together as possible now bend your elbows and plant your palms on the floor on to either side of your head with your fingers pointed towards your feet. Slowly lift your body off the floor so that your body forms a rainbow shape. Try to keep your elbows as straight as possible. So, that your chest remains open. Also, make sure that your toes are pointed straight forward. Not out to the sides. It's pretty tough to get the form right. Once you've got it down let's hold it for the next 30 seconds. 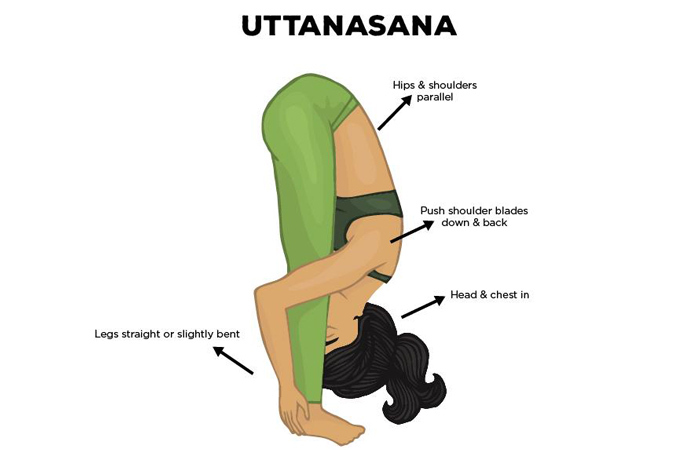 This pose is also called Urdhva Dhanurasana. It helps with blood circulation and opens up your lungs for deeper breathing as well and most amazingly it can boost your spirit effortlessly. Filling your mind with positive thoughts. So, that you'll have pleasant dreams at night. If you have a back injury, diarrhea, heart problems or high or low blood pressure. Don't try this pose. Exercise #3 Standing forward bend. Take a deep breath in and fold your torso over your legs. All of the bending should be in your hips, not your back! Don't lock your knees either. They should be bent slightly. 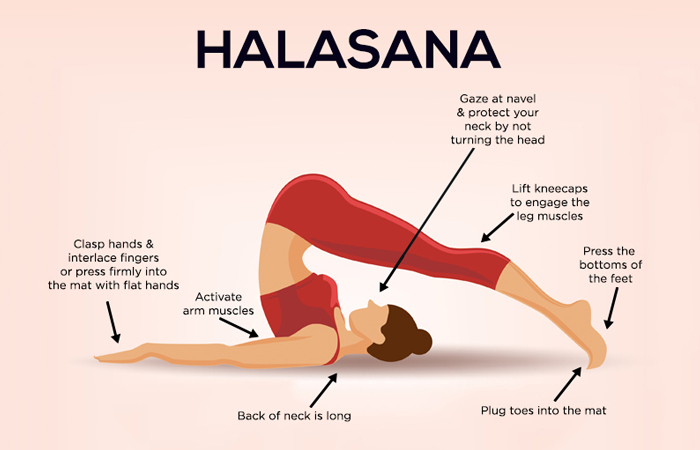 Hold this pose for about three or four breaths and then return to the initial position by slowly straightening your spine. Standing forward bend or Uttanasana is essential to strengthening your spine and keeping the blood flowing to your brain. So, that your mind is free of stressful thoughts. Some other health benefits of doing straightforward bends are, improved digestion and liver and kidney function, as well as reduced anxiety. The only people who shouldn't practice this pose are those with a back injury. Start by getting on all fours on the floor. Make sure to set your knees directly below your hips and your forearms on the floor with your shoulders directly above your elbows. Then exhale and lift your knees away from the floor. At first, keep your knees slightly bent and your heels lift it up off the floor. Hold your head between your upper arms and don't let it hang or press heavily against the floor. You can straighten your knees if you like but it's better to keep them bent so that your upper back is in tempted to round. If you have shoulder or neck injuries the dolphin pose isn't exactly for you. But apart from that, it's one of the most polling poses in yoga and of course it has tons of health benefits. It stretches your shoulders, hamstrings, calves, and arches. Helps prevent osteoporosis and relieves back pain and fatigue. It can also help calm your mind before sleep and fight mild depression. Exercise #5 Half Cobra Grasshopper. Lie down on your stomach with your legs together and your palms down on the floor right beneath your shoulders. Then straighten your elbows to lift your chest up off the ground. Lower your upper body a bit while lifting your feet up behind you. Spread your knees out to the sides of it while keeping your feet touching and that's the half cobra grasshopper pose for you. This unconventional pose was created by Casey Howe, an award-winning fitness instructor, an entrepreneur. Who runs a fitness blog called Blogilates. abdomen, thighs and spine. It's also great for your lungs as it opens them up and helps you inhale deeper. Start by lying on your back with your legs extended vertically up a wall. Hence, the name. Then raise your pelvis up off the floor however much you want or can. If it's hard for you to lift your pelvis. You can skip that part and just leave your legs raised up on the wall. Legs up the wall pose or Viparita Karani has always been one of the most relaxing and calming yoga poses. It restores your strength improves your inner stability, relieves stress and prepares the mind for a peaceful night's rest. But just like any other pose, Viparita Karani isn't for everyone. If you're on your period or have high neck or back problems. Skip this one. Exercise #7 Full Core Stretching. Let's finish our workout with a full core stretching exercise to seal the deal. So lie on your stomach and stretch your feet as far away from your body as you can. Press your shoulders towards each other and put your forearms on the floor. Slowly lift your body off the floor and straighten your arms. One of the most important things when it comes to stretching your back is to pay attention to your core too. This exercise, in particular, is great for your lungs as it opens them up for easier breathing. A perfect ending to a perfect workout don't you think! problems and a more toned body. The perfect win-win we're all looking for. 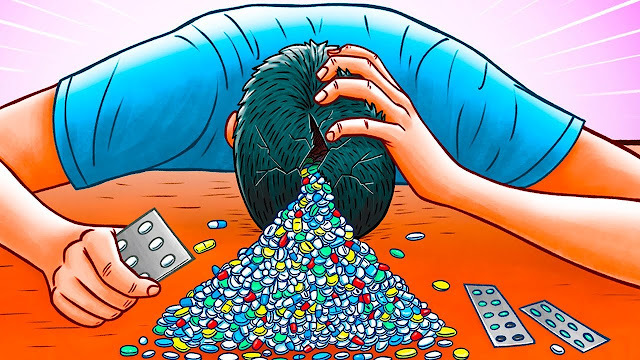 Do you have any tips of your own on how to get rid of insomnia or headaches share your expertise in the comments below.